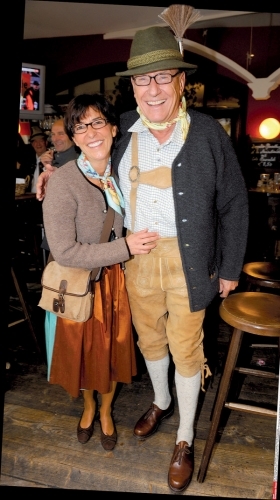 Lydia and Juergen Schrempp donned traditional garb for an Oktoberfest celebration last year. Now theyre neighboring restaurateurs. Juergen Schrempp is best known in the United States as the architect of the merger that created DaimlerChrysler and as the company's first CEO. But in retirement, he is pursuing a new career as a restaurateur. 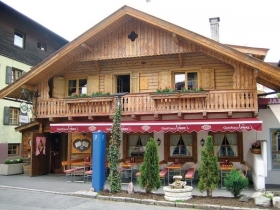 Schrempp is the proud owner of an inn in the trendy resort town of Kitzbuehel, Austria. Schrempp has bought the venerable Herzl, a rustic beer garden and tavern, and is having it remodeled. The inn is near Gabriele, an elite Italian restaurant that Schrempp's wife, Lydia, has opened. Juergen Schrempps new inn, Herzl: Look for ham sausage on the menu. Schrempp, known for his affection for hearty food and drink, hasn't revealed the culinary direction he wants Herzl to take. During his time in the top job at Daimler, he preferred to order simple ham sausages instead of the gourmet delicacies that the cooks at company headquarters served high-level executives and their guests.